Once your relationship to your SoulCollage® cards deepens, they become a source you can turn to for help and wisdom. Your sincere wish to receive an answer will connect you to the Source. One thing I aim to do is incorporate and integrate the SoulCollage® process into my daily life and discover the potential it has to balance and harmonize the senses and energies in this body/mind. Feeling sad after an intimate group of colleagues met then we parted ways, I eye my SoulCollage® deck and wonder whether or not I can image blue. I set the stage by lighting a candle, placing around the votive my Transpersonal Cards: The Source of All Creation, The Soul Essence, and The One Who Witnesses, to honor their existence and guide the reading. I close my eyes, shuffle the cards, spread them out on the table before me and feel for the one that wants to help. I lay the card faced-down and can tell by the little stamp mark on its backside that it belongs to the Council Suit. The Council Suit and its set of cards refers to those helpful beings both alive and those who have passed on from this realm to another. Some of these beings have chosen us and act as challenging forces in our lives. They can also act as guides, divine helpers in spirit or bodily form. Even a relative or ancestral being can be honored, respected and become part of this suit. In this suit archetypal figures make themselves known. These are the figures who influence how we respond to life and in relationship to others. We might find that we’re more the nurturing, caretaker type who’s influenced by the Great Mother, rather than the ambitious career type who’s challenging and driving force comes from the Goddess Athena. Becoming aware of the forces that either bind us or have the potential to heal us merits our time and consideration. The Council Suit participants have their light and shadow sides as well, so it’s best to make a card that realizes both. After all, isn’t it true that we are the sum total of what we’ve learn to become, yet— why not consider we are not what happened to us but what we choose to become? I turn the card over and I’m stunned. 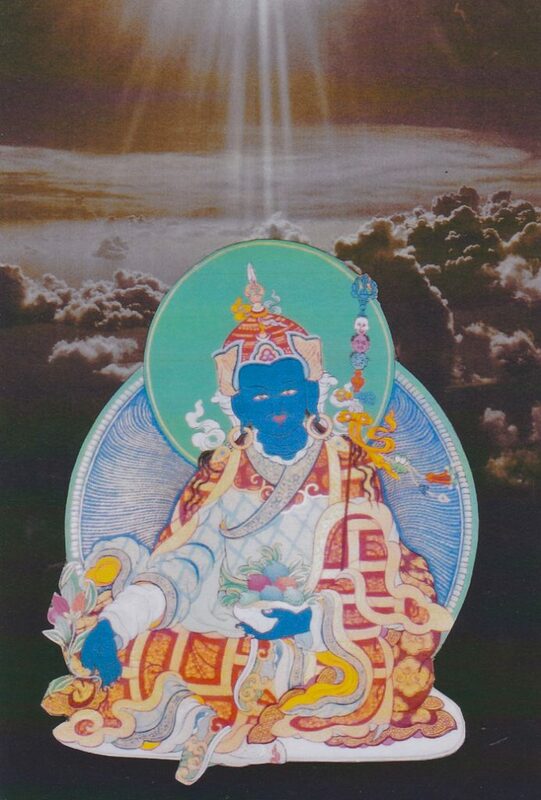 Padmasambhava as the Blue Medicine Buddha. Of all the cards that could have fallen into my hands. Not only is it a Council Card but a blue ray one at that. Coincidence? I beg to differ. The assumption I have about my own deck is no card is a wrong card. I respect every card I’ve made, and I am given this respect in return. Blue is a good thing. Blue refers to healing. Blue is the color of the Blessed Mother’s robe. The Medicine Buddha radiates blue. Ever associate a mood with a color? We say: “I’m in the pink when we’re happy. When there’s money in the bank we’re in the black, or lack thereof, in the red. Peachy refers to health, am red-faced drunk, am yellow a coward, turn green sick; feeling blue, feeling grey, it’s a black-dog day!” Every color is associated with a mood, an emotion that reflects our psychological state of being. I decide to put that mood and color to work for me. What am I doing? A form of the Expressive Arts. For the past five months I’ve been experientially involved with Natalie Rogers’s Person-Centered Approach to the Expressive Arts Therapy. Meeting with a group twice a month and experiencing this expressive arts approach myself, I intend to combine the process with SoulCollage® work.